Heat oven to 250 degrees. Melt margarine in large pan over low heat. Stir in Worcestershire and seasoned salt. 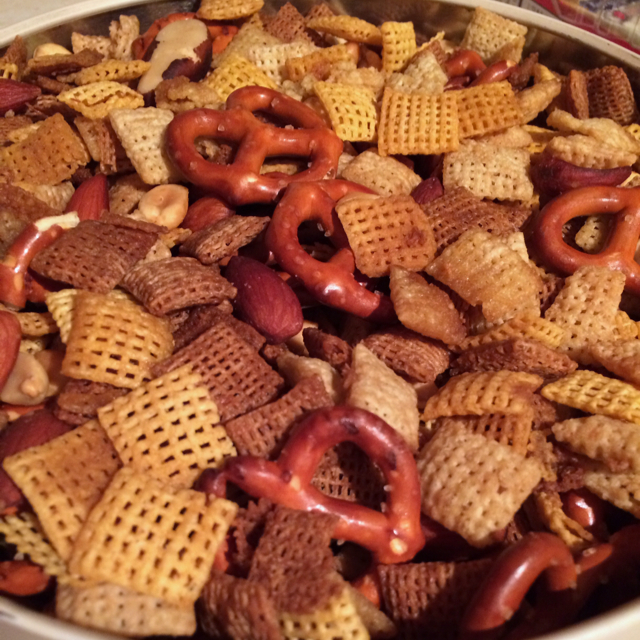 Add Chex, nuts, pretzel sticks. Stir til all pieces are coated. Heat in oven for 45 minutes. Stir every 15 minutes. Spread out on paper towels to cool. MICROWAVE DIRECTIONS: Melt margarine in large, microwave safe bowl, stir in salt and Worcestershire. Add cereal and nutes, til all are coated. Microwave on HIGH 5-6 minutes, stirring every 2 minutes. Spread on paper towels to cool. Store in a large zip-lock bag or airtight container..